Home Techniques and skills How to Clean a Grill: A Guide to a Spotless Grill! People often worry about why their grills are wearing off and find themselves not knowing what to do. Although grilling and barbecuing is not done on a daily basis, keeping your grill clean should be your priority if you want to be able to grill some delicious recipes for a long time. Recently, a number of acquaintances asked me for some tips on how to clean a grill. As a BBQ enthusiast at Grills Forever, I use my grills more often than I use my stove and honestly, BBQ grill cleaning is not so simple. So, here are some simple yet effective guidelines on how to take care of your BBQ grill. Always set a place where you will clean your grill beforehand. The process of cleaning can make your surroundings very messy. So just lay a paper outside so you can place your grill over it before cleaning. Cleaning a grill requires a proper type of brush. 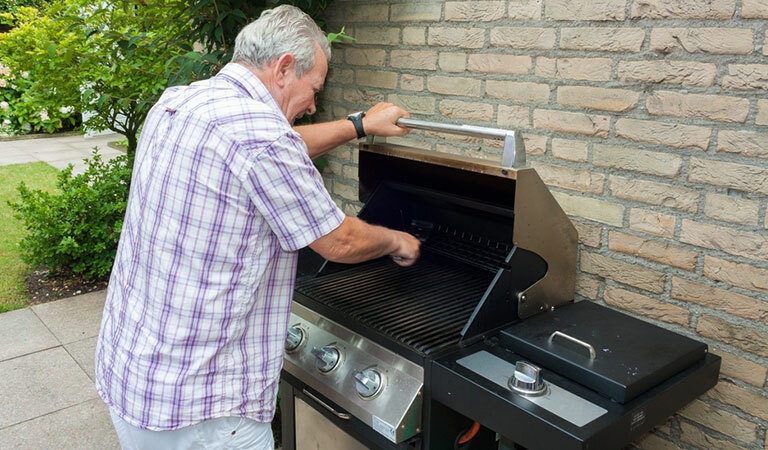 Remember, grills are outdoor appliances and after every usage, it collects food and oil. So, scraping off food will be required to clean every type of grill. Always have a brush made of stainless steel or brass bristles for your grill cleaning. Also, you should replace your grill brush once a year because it will lose bristles over prolonged usage. Choose a brush that has a long tough handle with a hole at the end so that you can hang it after use. 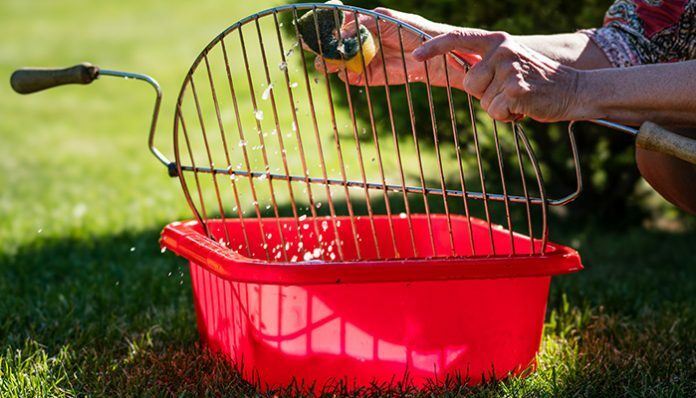 Buy a brush that comes with a scrub pad too, that could scrub the grill and prevent stickiness. I would recommend not using motorized grill brushes because these do not save time or energy. Nothing is better than cleaning your grills with your own hands. However, for your cast-iron grate, keep a soft sponge. Also, please wear gloves for your safety. How to Clean Cast Iron Grill Grates? Cast iron grills are very handy when it comes to grilling because it heats evenly and allows the heat to be retained for a prolonged period of time. Also, cast iron grills are highly durable and strong, but it has only one problem. Cast iron grills can easily rust in contact with water. Follow these 6 simple steps to cleaning grill made of cast-iron. Prepare to clean the grill right after use. Allow the grill grate to cool down a bit but still a little warm. Now use that grill brush to scrape off food and dirt. Create a solution of water and apple cider vinegar or baking soda at a 4:1 ratio and use a spray bottle to spray it over the grill grates. This will not only clean the grill but also remove contamination. 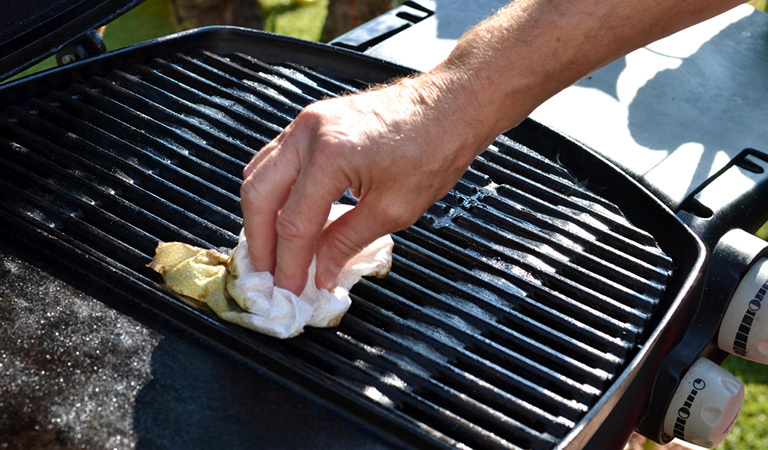 Use paper towels to wipe off the solution from the grill grates. Repeat this process until most of the food and oil has been removed. Earlier I did mention keeping a soft sponge. Use a mild soap to wet the sponge with, and wash the grate with this sponge to get rid of the remaining grease. Bear in mind this has to be done quickly, as prolonged exposure to water can deteriorate the cast-iron material. Rinse off the soap with warm water and then use a clean cloth to dry it completely. Use a cloth or paper towel to coat the grill with vegetable oil. To ensure that the oil covers every part of the grill grate, wrap them grates with aluminum foil. Now keep the foil-covered grates on the grill and set it to a high temperature. Close the lid and wait for 10 minutes. Your grill grate is now ready for reuse immediately. If you will store it, then ensure to store in a dry place. How to Clean Stainless Steel Grill Grates? Stainless steel grates are very durable, easy to use and almost no maintenance needed! Also, do not be under the impression that grill grates can be made to look as good as new. That does not happen because grill grates often develop patina. Patina is caused by the discoloration from the heat. No amount of grill cleaning can eliminate that. Clean the stainless steel grill grate right away after use. This saves you the hassle of cleaning on the day of your next BBQ event. Make sure it is still a little bit hot. If it is not, then preheat it. 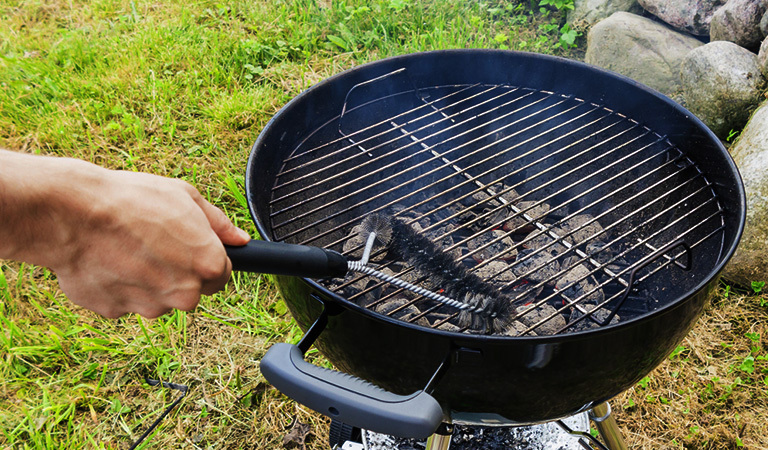 Use a brush with stainless steel bristles to scrape off stubborn food and oil particles while the grill is still hot. Season the grill with cooking oil to make the grill shine and also prevent rusting. How to Clean Porcelain or Porcelain-Coated Grills? Porcelain grates do not rust like stainless steel or cast-iron and they allow even distribution of heat, thus food is grilled evenly. Cleaning porcelain grills are also very simple. For these grills instead of using tough stainless steel or brass bristles, use a soft nylon brush, or medium-sized toothbrush. Using brushes with tough bristles would damage the porcelain. Also, use a scouring pad. Clean the grill after heating it for a while. Wear gloves. Heating would cause excess food and oils to melt and that would allow much easier brushing and scouring. Once it cooled down a little bit, then go on to brushing and scouring. Now season with oil and your grill is ready for its next BBQ party. Note: if you do not have nylon brush, ball up an aluminum foil sheet and use that to clean the grill grates. To remove tough grease you can create a paste of baking soda and water (½ cup soda to ¼ cup water) and apply to the grill. Let it rest for 20 minutes and then clean it off with your grill brush. Ensure to clean it off completely. How to Clean a Gas Grill Parts? If you own a gas grill and you are done with cleaning the grill grates, do not forget to clean the grill itself. Since you are turning the grill on for the purpose of heating the grills for cleaning, make sure to turn it off after you are done. 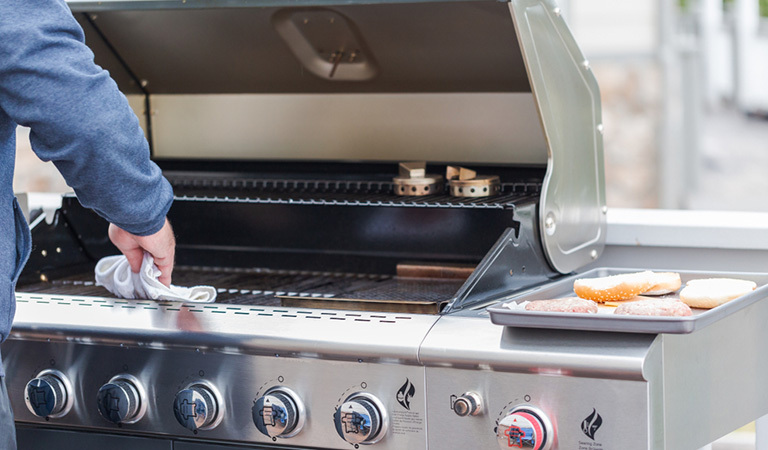 Ensure no propane is leaking while you are cleaning the gas grill. Remove the burner protectors and drop it into a bucket full of soapy water to get rid of the food and oil that drips from the grill grates above. When you use drip tray, always line it with aluminum foil, so that later, cleaning is much easier. Remove the drip tray and throw out any charred loose material and brush off any dust. The plates below the drip tray can also accumulate dirt, so if you can reach down there use a brush and scrub to remove dirt down there. Spray all these parts with a grill cleaner, but you can use either baking soda or vinegar for cleaning out the excessive grease too. Do not forget to clean the burners. Spray some grill cleaner onto the burners and use a paper towel to wipe. Lastly, scrub all these parts with soapy water and then use a water hose to get rid of the soapy water. Allow the gas grill to dry. Remember to keep the grill grates oily. Put all the parts back inside the grill and cover the gas grill with a grill cover. How to Clean a Charcoal Grill? So you have been grilling and cooking charred smoked food but you have no clue how to clean it. 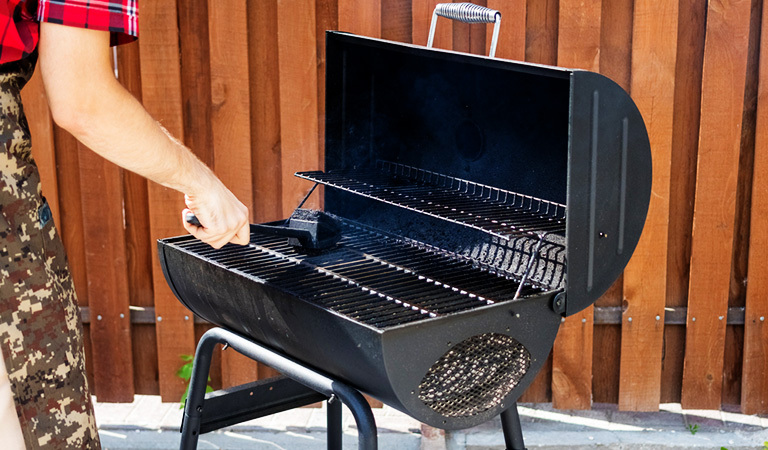 Smoking can cause your charcoal grill to become incredibly dirty so it is best to follow these steps to maintain a clean grill. Disassemble your charcoal grill and unscrew the kettle. Do not be lazy about it! Spray some oven cleaner (which contains sodium hydroxide) onto the kettle and the grates and keep them inside black trash bags. This will allow some time for the oven cleaner to get going on the grime and tough slime. Wear rubber or latex gloves to protect your hands. After some time, remove the kettle from the trash bag and start scrubbing with a brillo pad. Rinse the kettle with hose water and scrub more if needed. Scrub the exterior of the kettle with the brillo pad but do not use oven cleaner for the exterior. You can do the same process for the grill grates too. Reassemble the charcoal grill and allow it to dry for around 6-8 hours under the sun. Light it up with high heat and close the lid before next use to ensure it has no oven cleaner or water remaining. Try to clean your grill grates twice a year. If your grill is extremely dirty and using homemade materials to clean it is simply not helping, you can buy professional grill cleaners that come in spray bottles. This will help you with grill cleaning immeasurably. For porcelain grills, make sure the cleaner you buy is safe for this type. 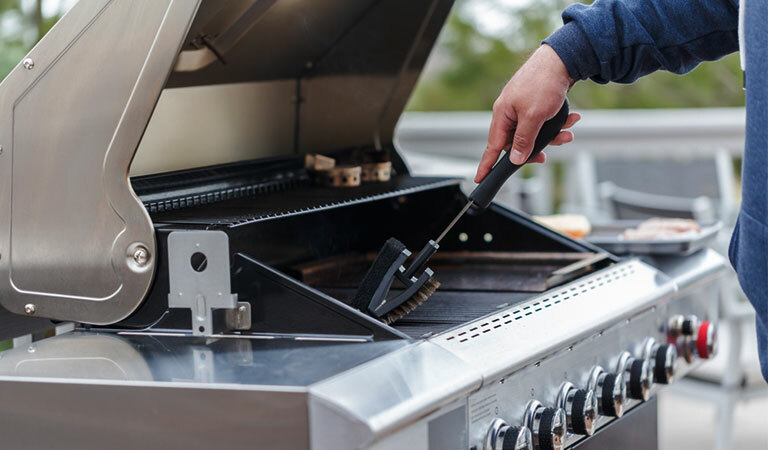 Since you are turning the grill on for the purpose of heating the grills for cleaning, make sure to turn it off after you are done. Now you are all set to use your grill for your next awesome BBQ party. I just finished cleaning my traeger following your steps. Truly you guys know what you’re talking! Saved me a lotta time. Cheers!